Incisions during cataract surgery are necessary to allow our doctors to gently break up and remove the cloudy lens. Your new replacement Intraocular Lens (IOL) is also put into place through this incision. Traditional cataract surgery involves making the incision with a hand-held blade and using an ultrasonic device to break up and remove the lens. While this method can still be effective, at Mosaddegh Eye Institute we have also invested in blade-free cataract surgery technology: the LenSx® laser. 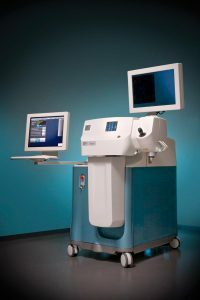 The femtosecond technology uses automated, computer-controlled laser pulses to create incisions on the lens capsule, crystalline lens and cornea for precisely tailored and accurate results. Each procedure is based on a high-resolution, 3-D surgical platform for both the incision and lens fragmentation. For most patients the procedure takes between 15-30 minutes and only causes mild discomfort after the procedure. To find out if laser cataract surgery in San Francisco is right for you, contact us today to schedule a Cataract Evaluation.